Reinbeck bei Hamburg: Rowohlt Taschenbuch Verlag, 2000. 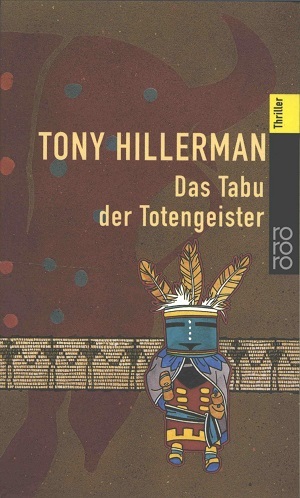 This is the fourth German edition of The Ghostway, the sixth book in Tony Hillerman's Navajo Mystery Series and the third novel featuring the protagonist Sergeant Jim Chee of the Navajo Tribal Police. This edition is published by Rowohlt as part of their RoRoRo thriller series. The title translates as "Taboo of the Spirits (or Ghosts) of the Dead." The cover, designed by Jürgen Mick, consists of a a kachina figure and a buffalo skull and a panel of figures holding hands. The text was translated by Klaus Fröba. Format: Paperback, 19 x 11.9 cm. Binding: Full-colored paper covers with the thriller number, title. author, and publisher's logo printed vertically on the spine.